2125. blablabLAB: Raul Nieves, Gerard Rubio, T. Saxena & M. Caminal. Haberlandt bio-reactor kitchen. Fresh algae vending machine. This biotechnological vending machine grows and maintains algae in a super optimized, continuous production state. It is designed for any culture, currently spirulina. By spherificating the dose, it avoids any packaging. Haberlandt produces, stores and delivers in the same place. For more information about this entry, contact the author. email: foreign.affairs@blablablab.org. Haberlandt Bio-Reactor Kitchen: Fresh Algae Vending Machine. Entry 2125. by blablabLAB: Raul Nieves, Gerard Rubio, T. Saxena & M. Caminal. 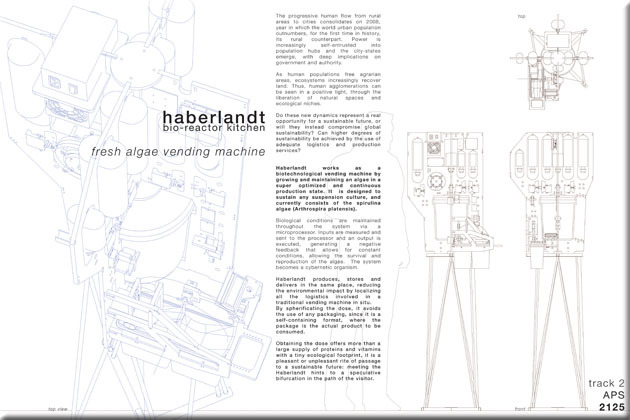 2:32 minute video of Haberlandt Bio-Reactor Kitchen: Fresh Algae Vending Machine. (2011).